A while ago, I decided that I needed a new laptop, and it so happened that all the planets aligned and that same week the Gigabyte Aero 15X with the new 8th gen Intel processors came out, so I went with it. And oh boy, am I pleased with that choice! The machine is a beast. I’ve been using it for a couple of months now and it holds really well. I won’t try to get into an in-depth review, as there are plenty of those already on youtube . Instead, I’ll give an overview of the machine, and then point out some of its disappointing failures. Yes, there are some! 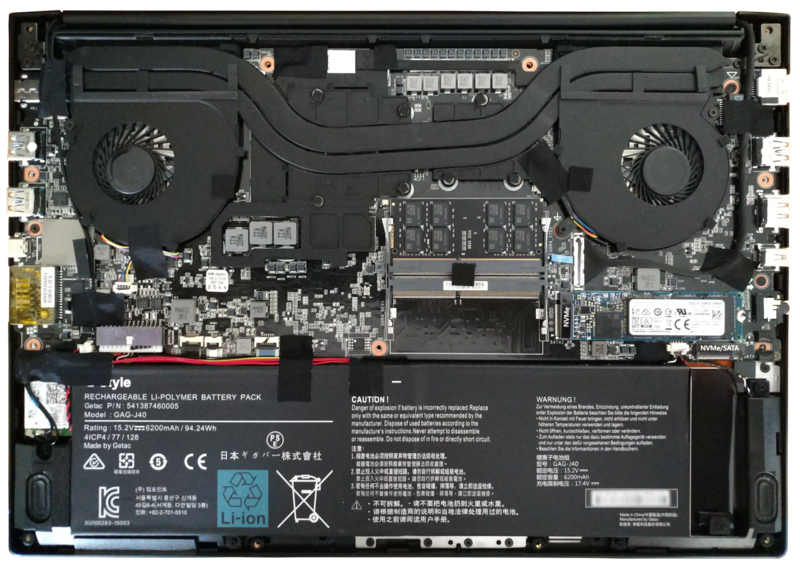 The laptop houses an Intel Core i7-8750H @ 2.2GHz, a Nvidia GeForce GTX 1070 with 8GB of memory, 16GB of DD4-2666 RAM, and a 512GB NVMe SSD. I complemented that with another 16GB of RAM for a total of 32GB, and 512GB of storage. It has a premium feel on it, its screen with the slim bezel looks great, and it’s really quiet… until you increase the load and the fans fire up. It’s not that bad, you don’t notice it after a while. I’ve been using the laptop with Ubuntu where I get around 3.5 hours of battery life. Don’t hope for that 10+ hours promise under Linux. The power connector has a firm connection, but if the plug gets off the locking position, it’s easy to fall. It happened to me a couple of times without realizing it while holding the laptop on my lap. Now the sad side. I cannot wrap my head around the fact that they succeeded in fitting so much power and features under such a small form factor and they managed to screw up on the most basic level. The keyboard is not for everybody, and the speakers are the worst I’ve seen on any device. The keys on the keyboard have a high actuation force, which, for me, has resulted in either missing presses or registering multiple presses. I tried playing around with some variables in the OS, but I saw no improvement. This means I am constantly being transferred to google because I mistyped an address in chrome, fail to enter passwords, skip tabs when attempting to get to the next one or close multiple windows when hitting that Alt-F4 combo. The speakers are not nearly loud enough. I have a better sound experience on my phone. I often have a hard time listening when watching videos. I tried wearing earphones, but eventually, I got tired of them and ended up ordering a Bluetooth speaker. I can still say that I am left with a good impression of the laptop. But in the future, unless Gigabyte handles these silly things on its 2500€ machine, I’ll keep my options open for my next laptop. In the next post, I’ll describe the steps for installing and setting up Ubuntu on the Aero 15X.